The lighthouse at this site was constructed in 1870. The brick-and-mortar tower included ornate iron balcony supports and a large keeper residence with enough space to house several families. 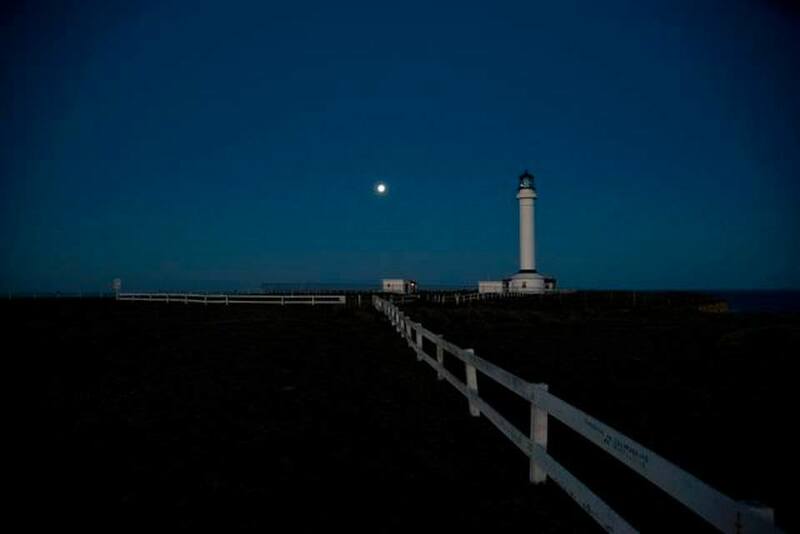 The April 1906 earthquake struck the light station. The keeper’s residence and lighthouse were damaged so severely they had to be demolished. The United States Lighthouse Service contracted with a San Francisco based company to build a new lighthouse on the site, and specified that it had to be able to withstand any future earthquakes. 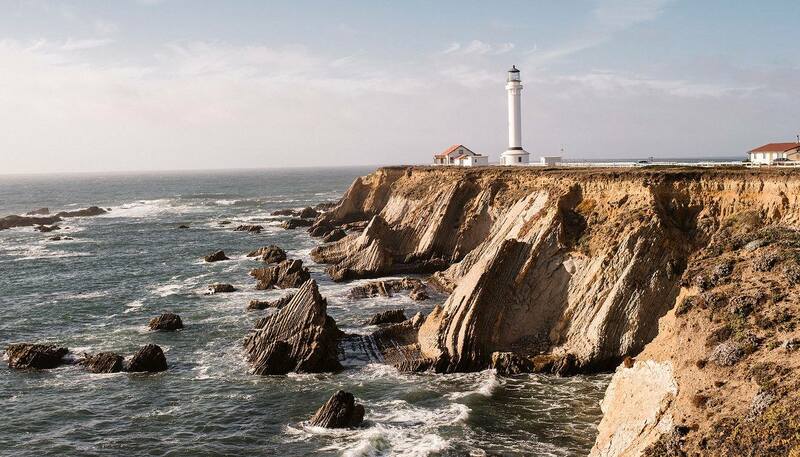 The company chosen normally built factory smokestacks, which accounts for the final design for the new Point Arena Lighthouse, featuring steel reinforcement rods encased in concrete. This was the first lighthouse built this way. The new lighthouse began operation in 1908, nearly 18 months after the quake. It stands 115 feet tall, and featured a 1st Order Fresnel Lens, over six feet in diameter and weighing more than six tons. The lens was made up of 666 hand-ground glass prisms all focused toward three sets of double bullseyes. It was these bullseyes that gave the Point Arena Lighthouse its unique “light signature” of two flashes every six seconds. The optics, which held an appraised value of over $3.5 million, was set in solid brass framework, and was built in France. Prior to the introduction of electricity, the lens was rotated by a clockwork mechanism. The Keepers, or “wickies” as they were called, had to hand crank a 160-pound weight up the center shaft of the lighthouse every 75 minutes to keep the lens turning. Light was produced by a “Funck” hydraulic oil lamp, that needed to be refueled every four hours, and whose wicks would have to be trimmed regularly. Later, two 1,000 watt electric lamps were installed to replace the oil lamp, and a ​1⁄8 horsepower electric motor was installed to replace the clockworks. 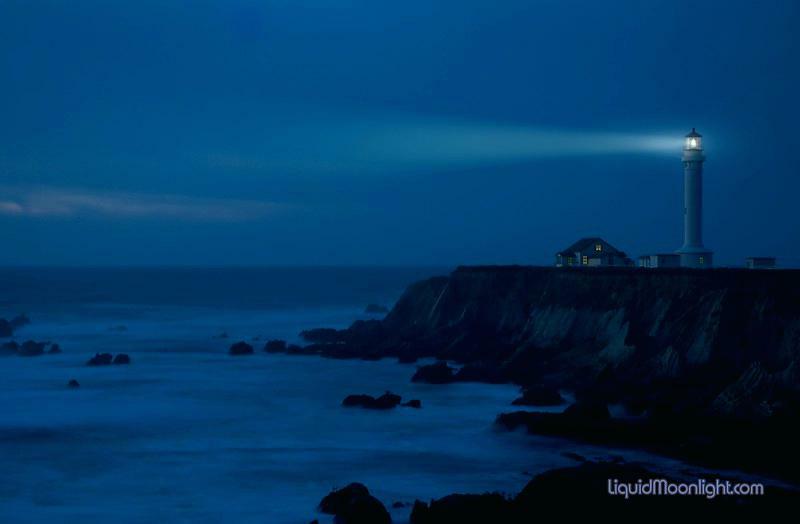 Below are three recent photos of the Point Arena Lighthouse. Posted in 1906 Earthquake, Point Arena. A split on the north end of East Street from the earthquake. East St. is now the Embarcadero. 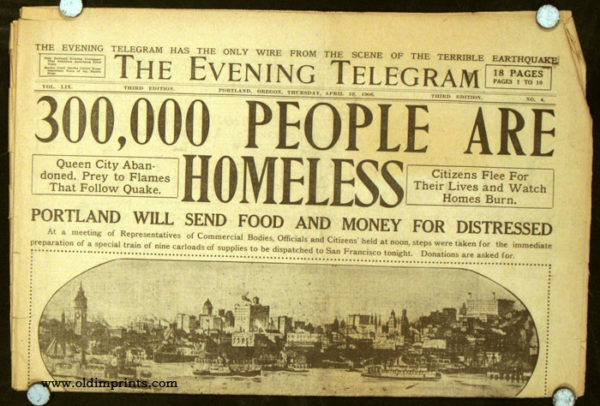 San Francisco, California: 1906. The headlines pretty well tell the story. I was trying to find out when the State of California and Fort Bragg received the greatest rainfall. 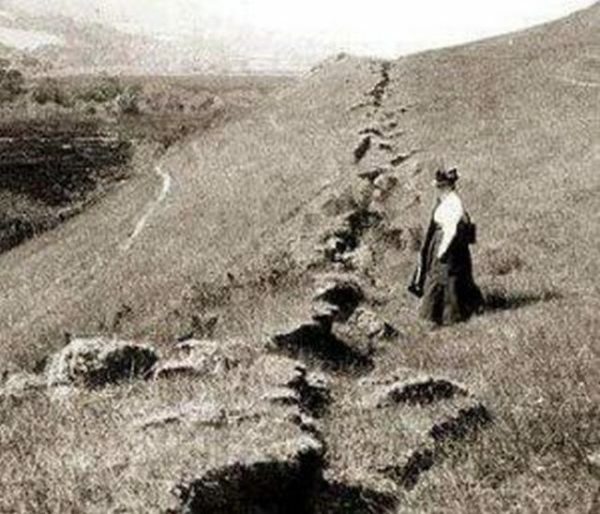 I am still totally freaked out by what I found ……..
“Geologic evidence shows that truly massive floods, caused by rainfall alone, have occurred in California every 100 to 200 years. Such floods are likely caused by atmospheric rivers: narrow bands of water vapor about a mile above the ocean that extend for thousands of miles. 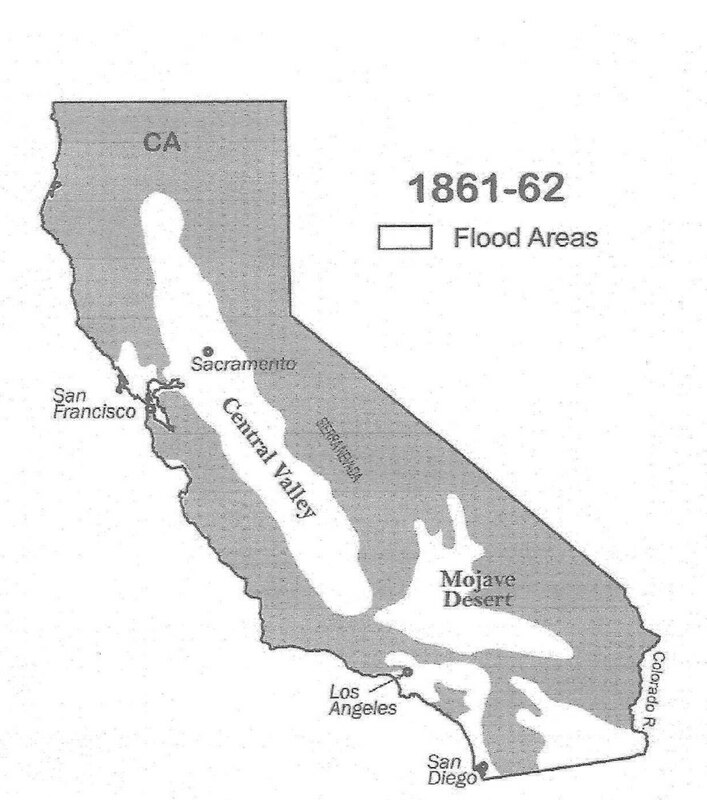 The only megaflood to strike the American West in recent history occurred during the winter of 1861-62. California bore the brunt of the damage. This disaster turned enormous regions of the state into inland seas for months, and took thousands of human lives. The costs were devastating: one quarter of California’s economy was destroyed, forcing the state into bankruptcy. Today, the same regions that were submerged in 1861-62 are home to California’s fastest-growing cities. Although this flood is all but forgotten, important lessons from this catastrophe can be learned. Much of the insight can be gleaned from harrowing accounts in diary entries, letters and newspaper articles. In 1861, farmers and ranchers were praying for rain after two exceptionally dry decades. In December their prayers were answered with a vengeance, as a series of monstrous Pacific storms slammed—one after another—into the West coast of North America, from Mexico to Canada. The storms produced the most violent flooding residents had ever seen, before or since. Sixty-six inches of rain fell in Los Angeles that year, more than four times the normal annual amount, causing rivers to surge over their banks, spreading muddy water for miles across the arid landscape. 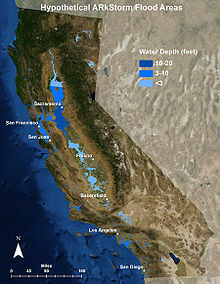 Large brown lakes formed on the normally dry plains between Los Angeles and the Pacific Ocean, even covering vast areas of the Mojave Desert. In and around Anaheim, flooding of the Santa Ana River created an inland sea four feet deep, stretching up to four miles from the river and lasting four weeks. Residents in northern California, where most of the state’s 500,000 people lived, were contending with devastation and suffering of their own. In early December, the Sierra Nevada experienced a series of cold arctic storms that dumped 10 to 15 feet of snow, and these were soon followed by warm atmospheric rivers storms. The series of warm storms swelled the rivers in the Sierra Nevada range so that they became raging torrents, sweeping away entire communities and mining settlements in the foothills—California’s famous “Gold Country.” A January 15, 1862, report from the Nelson Point Correspondence described the scene: “On Friday last, we were visited by the most destructive and devastating flood that has ever been the lot of ‘white’ men to see in this part of the country. Feather River reached the height of 9 feet more than was ever known by the ‘oldest inhabitant,’ carrying away bridges, camps, stores, saloon, restaurant, and much real-estate.” Drowning deaths occurred every day on the Feather, Yuba and American rivers. In one tragic account, an entire settlement of Chinese miners was drowned by floods on the Yuba River. This enormous pulse of water from the rain flowed down the slopes and across the landscape, overwhelming streams and rivers, creating a huge inland sea in California’s enormous Central Valley—a region at least 300 miles long and 20 miles wide. Water covered farmlands and towns, drowning people, horses and cattle, and washing away houses, buildings, barns, fences and bridges. 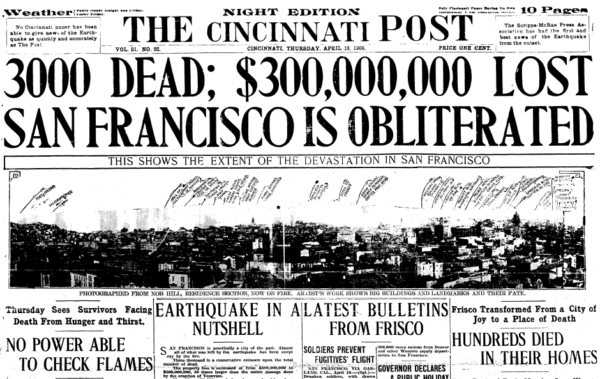 The water reached depths up to 30 feet, completely submerging telegraph poles that had just been installed between San Francisco and New York, causing transportation and communications to completely break down over much of the state for a month. One-quarter of the state’s estimated 800,000 cattle drowned in the flood, marking the beginning of the end of the cattle-based ranchero society in California. One-third of the state’s property was destroyed, and one home in eight was destroyed completely or carried away by the floodwaters. Sacramento, 100 miles up the Sacramento River from San Francisco, was (and still is) precariously located at the confluence of the Sacramento and American rivers. In 1861, the city was in many ways a hub: the young state’s sparkling new capital, an important commercial and agricultural center, and the terminus for stagecoaches, wagon trains, the pony express and riverboats from San Francisco. Although floods in Sacramento were not unknown to the residents, nothing could have prepared them for the series of deluges and massive flooding that engulfed the city that winter. 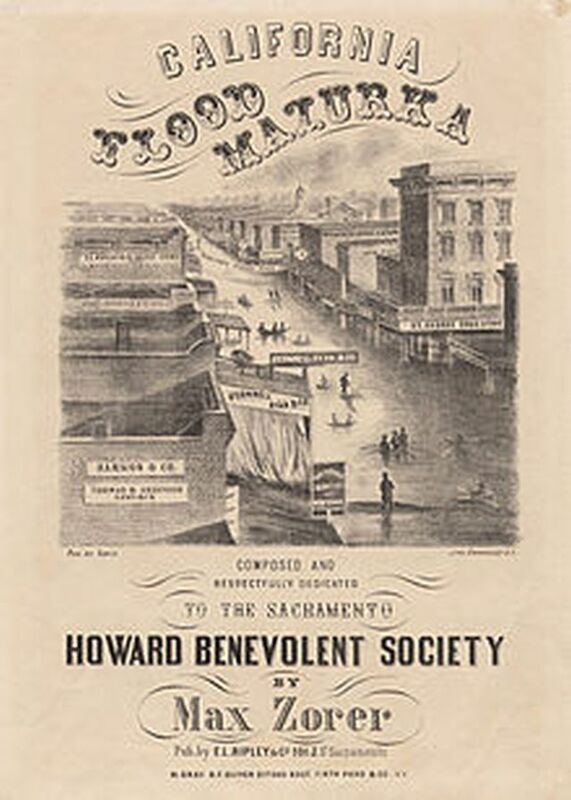 The levees built to protect Sacramento from catastrophic floods crumbled under the force of the rising waters of the American River. In early January the floodwaters submerged the entire city under 10 feet of brown, debris-laden water. The water was so deep and dirty that no one dared to move about the city except by boat. The floodwaters caused immense destruction of property and loss of life. 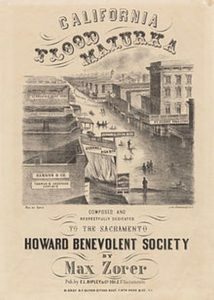 California’s new Governor, Leland Stanford, was to be inaugurated on January 10, but the floodwaters swept through Sacramento that day, submerging the city. Citizens fled by any means possible, yet the inauguration ceremony took place at the capital building anyway, despite the mounting catastrophe. Governor Stanford was forced to travel from his mansion to the capital building by rowboat. Following the expedited ceremony, with floodwaters rising at a rate of one foot per hour, Stanford rowed back to his mansion, where he was forced to steer his boat to a second story window in order to enter his home. 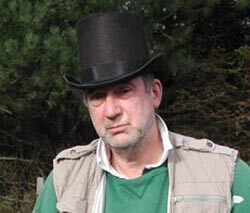 Conditions did not improve in the following weeks. California’s legislature, unable to function in the submerged city, finally gave up and moved to San Francisco on January 22, to wait out the floods. 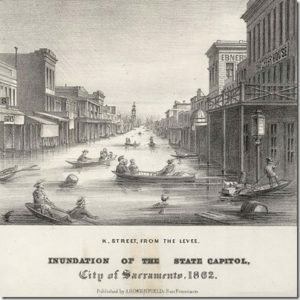 Sacramento remained underwater for months. Downstream of Sacramento, towns and villages throughout the eastern San Francisco Bay Area were struggling with catastrophes of their own. 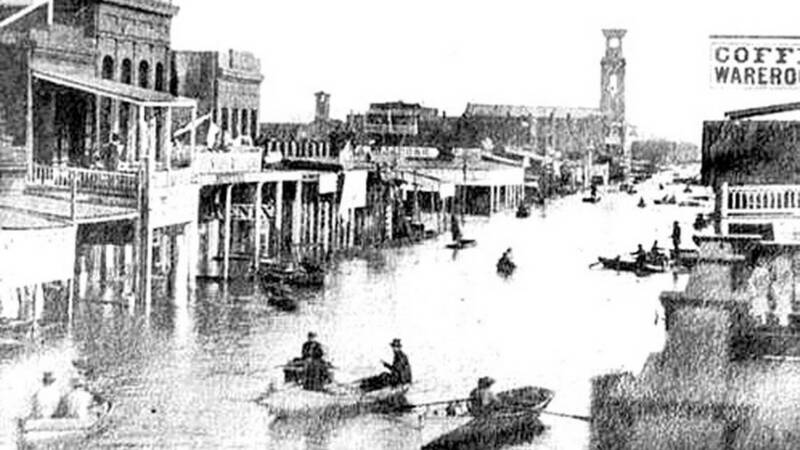 Twenty miles northeast of San Francisco, four feet of water covered the entire town of Napa; to the east, the small town of Rio Vista on the Sacramento River was under six feet of water. The entire population of Alamo, at the foot of Mt. Diablo 50 miles east of San Francisco, was forced to flee rising floodwaters. People abandoned their homes in the middle of the night. Some found refuge, others drowned. The San Ramon Valley was one sheet of water from hill to hill as far as the eye could see. The destructive force of the floods was awesome: houses, otherwise intact and complete with their contents, were carried away in the rapids; horses, cattle, and barns were swept downstream for miles. The heavy rains also triggered landslides and mud slides on California’s steep hillsides. For instance, in Knights Ferry and Mokelumne Hill, nearly every building was torn from its foundation and carried off by thundering landslides, and a major landslide also occurred at the town of Volcano in the Sierra foothills, killing seven people. As I read it it’s not a question of whether it will happen again but when. Global warming anyone??????? Fort Bragg is, give of take, 170 miles from San Francisco. When you enter the door of our layout in Fort Bragg there is a leaning lighthouse and a poster explaining that the Point Arena was toppled in the 1906 earthquake. There is another poster adjacent to the Jug Handle Creek diorama showing the huge trestle that spanned the Jug Handle Creek before and after the earthquake. The Jug Handle Creek trestle was completely destroyed in the earthquake. Notwithstanding the pictorial evidence I am frequently asked if the 1906 was felt in Fort Bragg. Visitors seem surprised to learn that not only was it felt in Fort Bragg it was felt along the entire Mendocino Coast. An oft repeated comment is “Wow, I didn’t know that.” To see photos of some of the damage along the Mendocino Coast, click here. 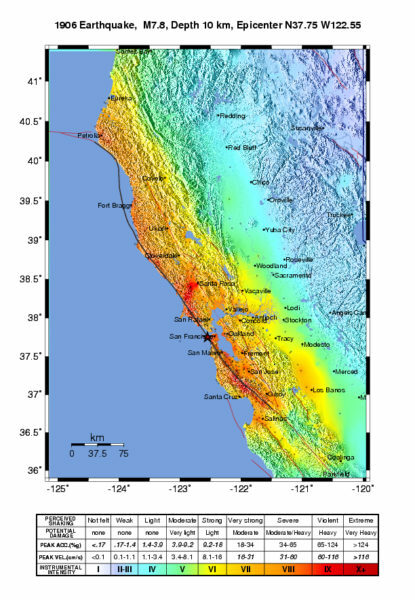 The black line is the San Andreas fault. As you can see the quake was felt very widely. If my reading of the colour coding is correct Fort Bragg is in the moderate to heavy area of damage. Proof?